There’s never a good time to let heartburn get in the way, especially when you’re sharing good food with family and friends. 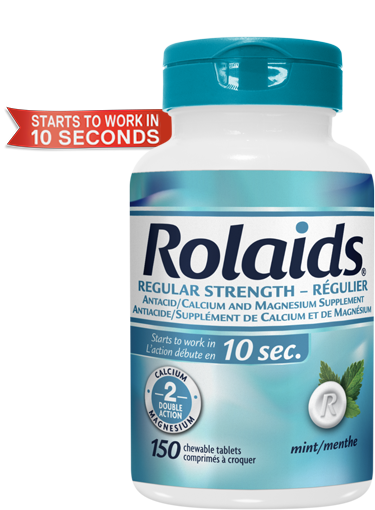 ROLAIDS Regular Strength Tablets with DOUBLE ACTION goes to work wherever you are, whenever you need it. Goodbye heartburn, hello good times. Adults: chew 2 to 4 tablets as symptoms occur or as directed by a doctor. Do not take more than 14 tablets in a 24-hour period. Pregnant Women: chew 1-2 tablets as symptoms occur or as directed by a doctor. Maximum: 6 tablets/day. Adults and pregnant women: chew 1-2 tablets after meal or as directed by a doctor. Maximum: 6 tablets/day. Calcium carbonate contains calcium. Calcium helps to build and maintain strong bones, and ROLAIDS provides an effective serving of this important nutrient. Taking ROLAIDS is a great way for people who are concerned about calcium intake to supplement their diet with this essential mineral.